‘Truth and Scars’ would be the ideal name for a future Rod Picott album. However, let’s not get ahead of ourselves, but the sentiment of these two words threads right through his new record. OUT PAST THE WIRES is the equally astute title for this release, which surfaces in a double unit format to house the twenty-two tracks that made the cut from an enormous choice of songs at his disposal. Prolific is probably an understatement for an artist so immersed in the song writing game. Of course, such an extensive content makes demands on the listener and there are certain tricks to getting the best out of a Rod Picott record. Essentially, this is to grasp the lyrical offering, which slants towards a perceptive view on life far away from the victors in society. Frequently, this focusses on the post-industrial landscape that doubles up as a take on the human side of urban blight and rural abandonment. Indeed, the album title, which appears early in the opening track of disc 1, suggests a zone where life is a struggle and the perpetual characters that infiltrate the narration are naturally ‘the afflicted’. Thus you can describes Picott’s writing as political with a small ‘p’, although the solutions are often thrown in as crumbs of self-fulfilling comfort and inner hope. Musically, the album is characterised by an earthy gruffness that has long been a much-loved trait of Rod Picott’s vocals. Under the stewardship of Neilson Hubbard at the production helm and a team of players including Will Kimbrough on guitar, the sound spans the tempo spectrum including a fair few standard roots rockers thrown into the mix alongside the usual downbeat numbers. Both formats add to the appeal of the record. Unlike some double albums, there does not seem a natural split to the themes of each disc. To get the most out of it, a fair amount of stamina is required, though riches do eventually reward the endeavour. In tune with a touch of precedence, there is the usual song exchange with his long-term song-writing friend Slaid Cleaves. Fans of both artists will be familiar with this process and four of the six co-writes to feature are from this combination. ‘Take Home Pay’ and ‘Primer Gray’ were both included on the last Slaid Cleaves album and it is of little surprise that their inclusion here sees them among the pick of the tracks. Primarily, Rod Picott ploughs a solitary route, and it has been a long time since any of his tours have been anything but. Shades of dourness are an essential ingredient into his music that at a stretch does contain an optimistic streak within the extensive bouts of pessimism. ‘We All Live On’ and ‘Little Things’ do ensure disc 2 ends on a positive note, especially on the back of probably the album’s most depressing track ‘Bottom of the Well’. Beginning with the line ‘he’s gonna drink himself to death now’, the tone of the latter is suitably set. Joining the two aforementioned, Slaid Cleaves co-writes, as the high spots of disc 1 are the realistic rocker ‘A Better Man’ and the cynically stricken ‘Coal’, which is a rare dip into blame territory. Picott’s writing is fully in tune with the symbolic pockets of western society that have proved fertile ground for certain political exploitation. There is scope for development from the implied coping strategies into firmer solutions, but who can predict the future direction of a songwriter’s mind. The pick of disc 2 includes the excellently written ‘Diamonds in the Dirt’ with its count your blessings sentiment and the upbeat, yet still plight ridden with a hint of hope, ‘Store Bought’. ‘Straight Job’ is a decent piece of narrative based story telling of springing into action. While Rod Picott will always remain his own man, the temptation to hail ‘Hard Luck Baby’ as a true heartland rocker in the vein of Springsteen and Mellencamp is too good to miss. OUT PAST THE WIRES is a compelling album and not really one to dip into on a casual basis. This is symptomatic as to why Rod Picott will always be on the outer periphery of the mainstream. However, artist and fan base are always likely to be content with this scenario, and, on the evidence of material left on the cutting room floor, an eventual album count well into double figures will surely follow. 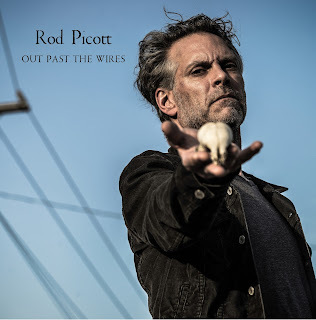 It may take a certain mind-set to believe in the music of Rod Picott and the intent of his post-industrial message. Possessing it is the ultimate key to getting the most out of this extensive release.